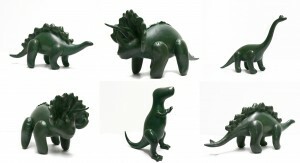 In Lost World at Gow langsford Gallery, Lorne Street, sculptor Gregor Kregar combines structures made from recycled glass with large stylized bronze dinosaurs. Through this unusual juxtaposition the artist creates an environment to surprise and engage the viewer. Kregar’s interest in dinosaurs was sparked by observing his four year old’s fascination for these creatures. Intrigued by reading him dinosaur books before bed each night and finding plastic replica all over the house, the artist was spurred to create his own setting in which to bring these prehistoric animals to life.